On any metal surface that even has the chance of being exposed to water, you expect rust. However, it is somewhat less expected to show up on your concrete, but it can and if the right conditions are met, it will. So how does that big orange rust stain show up on your concrete when it isn’t a metal surface? There are a few culprits. Most commonly, you will find rust stains on concrete from metal ornaments or lawn furniture. You will typically find smaller rust stains where the metal had contact with the surface. However, if you have a larger rust stain, you will want look to nearby irrigation systems. Some water has trace amount of iron inside and when iron meets water, it creates rust. Thus if your sprinkler system is overflowing onto your concrete, it is likely to blame for that ugly orange stain. Now that you know where the rust probably came from, what can you do about it? Scrubbing concrete with a cleaner formulated for rust can help to dull the stain, but it doesn’t completely remove it. The real issue is that concrete has pores, and like with dirt, once rust gets into those pores, you need to go in and clean them. The best way to do this is with power washing. The high pressure water penetrates and cleans concrete better than any scrub brush ever could. 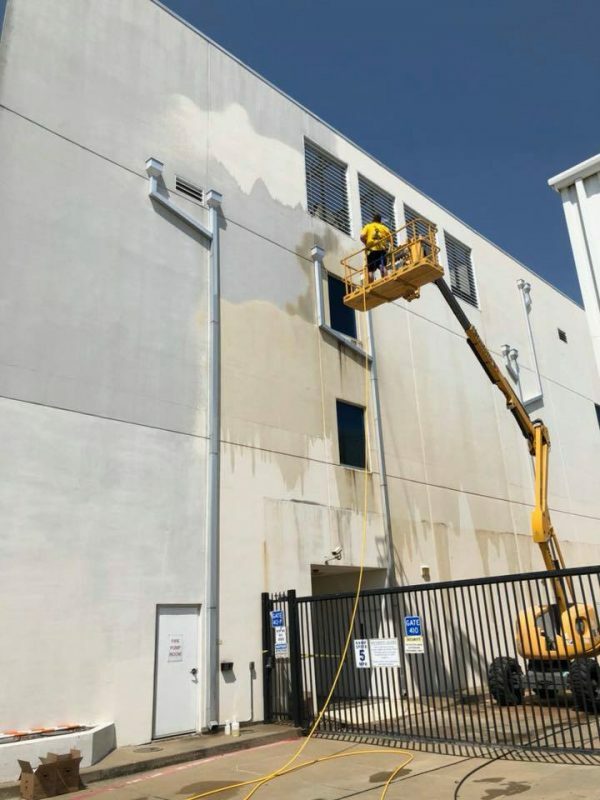 By contacting a skilled power washing company, they can save you several afternoons of scrubbing by cleaning that ugly stain away in just a few minutes. By pre-treating with a rust remover and then giving it the power washing treatment, that stain is gone. However, it isn’t gone for good if the cause isn’t treated. If you have rust stains or even just dirty exteriors that need cleaned, contact us today.